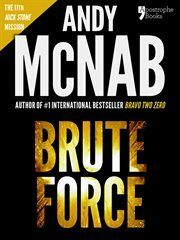 The item Brute force, Andy McNab, (electronic resource) represents a specific, individual, material embodiment of a distinct intellectual or artistic creation found in Austin Public Library. A cargo ship is apprehended by the authorities off the coast of Spain, packed with enough arms and ammunition to start a war. Twenty years later, an unknown aggressor seems intent on taking out those responsible for the treachery - one by one. The last victim was brutally tortured with a Black & Decker drill and then shot through the head at point-blank range. And Nick Stone - ex-SAS, tough, resourceful, ruthless, highly trained - is next on the killer's list. He has only two options - fight or flight - but which do you choose when you don't know who you are up against?